What should a silhouettist’s approach to data be? This question has been much on my mind recently. I’m not alone; the launch of GDPR in Europe – and the subsequent wave of reply-or-unsubscribe emails – has got everybody thinking. What kind of data do I use? For me, the question has caused me to reexamine some of my most fundamental ideas about the role of silhouettes in society. 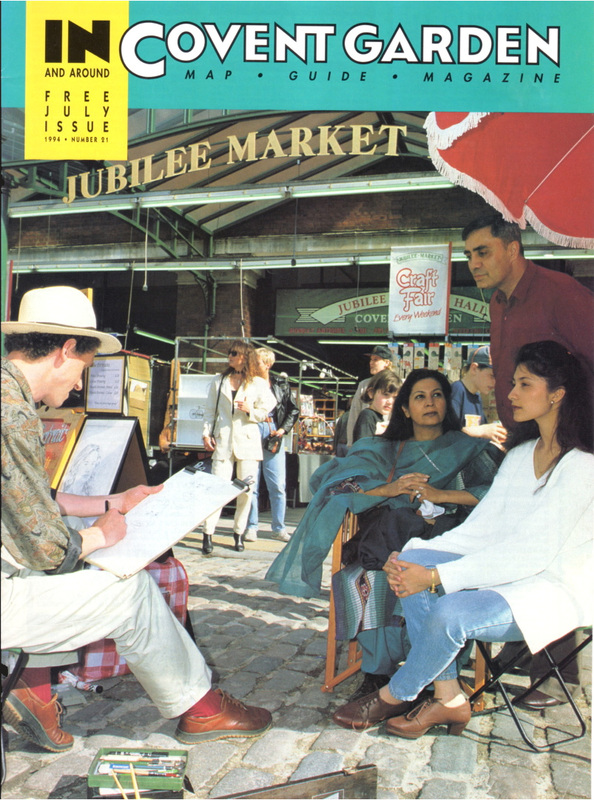 My portrait stand featured on the cover of “In and Around Covent Garden” in July 1994. As you may or may not know, I began my career as a street artist. 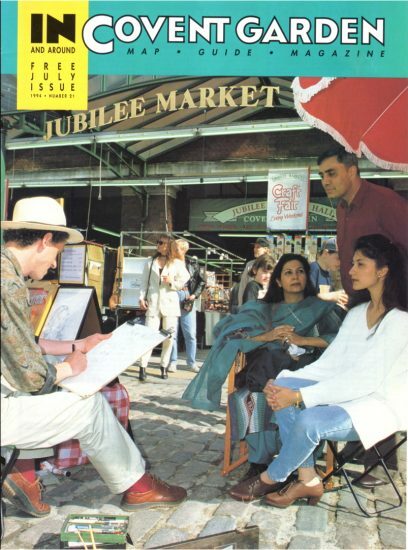 In the early 1990s I could be found every weekend drawing portraits in the piazza at Covent Garden, London. 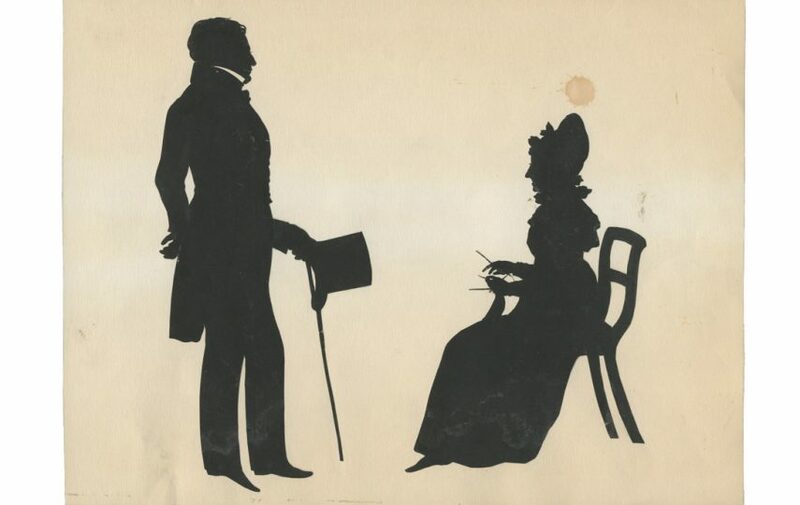 At the same time, I was teaching myself to cut silhouettes by studying the work of historical artists. I did this by collecting old silhouettes, particularly those made by freehand cutting – the technique I was most interested in. Today this collection numbers many hundreds of portraits, all made by the street artist of their day. Studying them has shown me what to do and, often, what not to do. They taught me the importance of smooth and steady cutting, how cut-away paper can mark the collar of a white shirt, how to indicate eyelashes and glasses, etc, etc. One of the things I realised I shouldn’t do is to copy the traditional silhouettist’s approach to data. What data did they record? In most cases, almost none. Today, as a collector of silhouettes, I know the importance of data. Collectors know that a silhouette without data is worthless, the value is largely determined by what’s known about it. Who made it? When and where was it cut? Who is it of? Without this information many interesting-looking silhouettes are sadly worthless: just unknown people cut by unknown artists. If you make a quick search on eBay you’ll see hundreds of them, unsigned and unloved. They’re no use to me or any other collector I know. The popularisation of the postcard in the early twentieth century gave silhouettes a new lease of life. Artists began cutting profiles at tourist centres all over Europe and the USA and pasting them onto blank postcards to be sent home to family and friends. These were hugely popular throughout the 1900s (until the outbreak of the Great War) and again in the 1920s & 30s. “Wer ist das?” (Who is this?) and “The One with the Hat”. Who indeed? 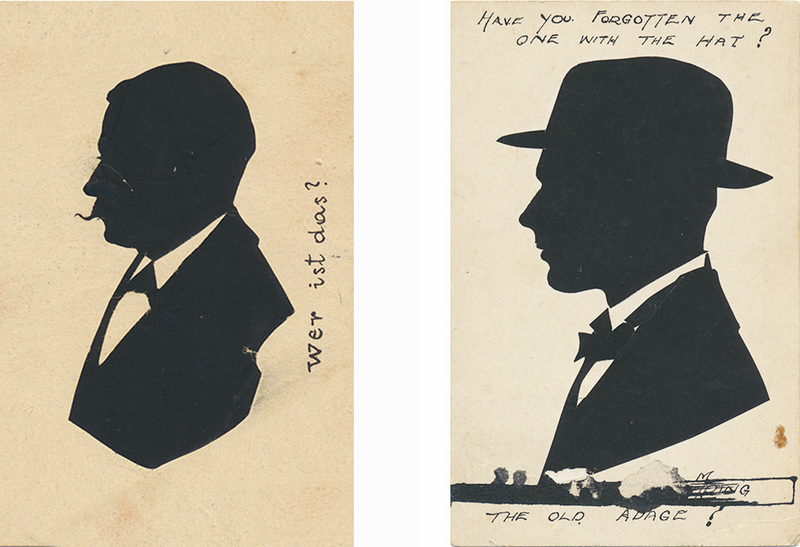 Two early postcard silhouettes with a typically frustrating lack of data. Looking at the work of these early street silhouettists I’m struck by how few of them bothered to sign their work, or identify it in any way, let alone add a date. The reason was simple: speed. Incredible as it may seem, the extra few seconds it takes to sign a silhouette meant it was not cost effective to do so. Selling their silhouettes for a shilling or two a time, their need was to cut as many as possible as quickly as possible. The most annoying silhouettes are those where the subject has added “Who’s this?” or “Guess Who!” before posting it. This was probably funny at the time, but today the joke is on them. Who are they indeed? History does not recall and one can only speculate. Their captions simply emphasise the frustrating lack of data. Of course, the need for speed is a pressure I can easily relate to. Today, many of my own clients are concerned by the number of silhouettes I can cut in the time available at their event. Sometimes a minute or two per cutting just isn’t quite fast enough! Like the postcard silhouettists I don’t have time to sign each one, I need to quickly move on to the next. For this reason, I mount all my own silhouettes onto backing cards with my name and a printed signature. The cards also include a section prompting guests to add their own extra data: their name, the date, and the occasion at which it was cut. 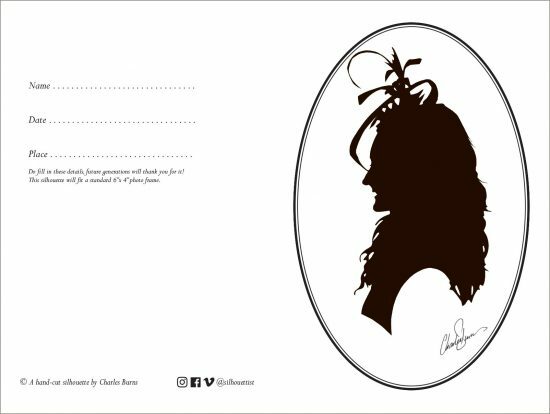 Roving Artist silhouettes include the name of the artist, a printed signature, and prompts for guests to add extra data. Furthermore, we offer all our clients the chance to have their own branded cards printed for their event, complete with their logo, the date, and the location of the event. These cards ensure the perceived value of the guest’s silhouettes will last long into the future. They will not end up as unknown cuttings of unknown people. 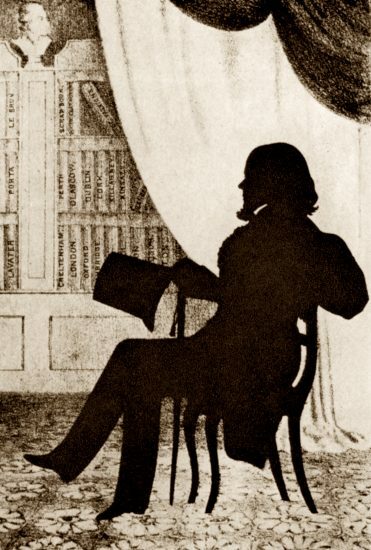 A very different silhouettist’s approach to data is exemplified by the well-known nineteenth-century artist August Edouart . A French refugee from the Napoleonic wars, Edouart was the first artist in England to call himself a “silhouettist” rather than a “profilist” (the term in use at the time). By doing so, he is responsible for bringing the French word “silhouette” into the English language. August Edouart with his duplicate albums. He named each album by location: Cheltenham, Oxford, Edinburgh, etc. Edouart cared a lot about data and was most fastidious in his record keeping. Like me, he followed the silhouettist’s tradition of keeping duplicate copies of all his work, which he pasted into large albums. For every silhouette he recorded the location and date of cutting, and (unlike me) the name and age of the subject. Unbelievably, he wrote all this information out five times! He wrote it straight away onto the back of the silhouette itself, and then later into his “day book”. After pasting the silhouette into an album he rewrote this information neatly underneath the silhouette and then copied it into the index to that album. Lastly, he copied them all into a massive general index, enabling him to find any silhouette anywhere in the collection. It’s hard to imagine spending quite this much time archiving one’s own work. However, one thing is for sure: here was a man who really understood the importance of data. Sadly, Edouart later lost many of his albums in a shipwreck. Those that survive provide an amazing resource for those interested in silhouettes. His various indices have enabled many of his duplicates to be found and purchased by descendants of the original subjects. If you are lucky enough to come across one of Edouart’s silhouettes on eBay you’ll need to pay thousands of pounds to buy it. You’ll find them more often in the main art auction houses: Sotheby’s, Bonhams, and the like. What a difference the data makes! The story of Edouart is a fascinating one. I am always happy to speak about his work – whether in relation to his obsession with data or not! These days every silhouettist needs a data-protection policy document. If you’d like to read mine you can find it here. Writing it – like everything I do pertaining to silhouettes – has been a lot of fun and a learning experience. I hope it encapsulates my own silhouettist’s approach to data, as well as making us GDPR compliant. Good to find something amusing on GDPR! I love the twist on John Adam’s quote “Every problem is an opportunity in disguise” – here a GDP necessity reified into a marketing opportunity. I think working as street artist comes with determination and hard work. It puts you out there to showcase what you can do with your hand.